We are the Porpoise Conservation Society. Porpoises: small, inconspicuous in their behaviour, apparently silent — and often overlooked. We want to change that. We support research on porpoises. In order to protect species, we need to understand them. That is why we support and contribute to scientific research on porpoises. We must save the vaquita porpoise. 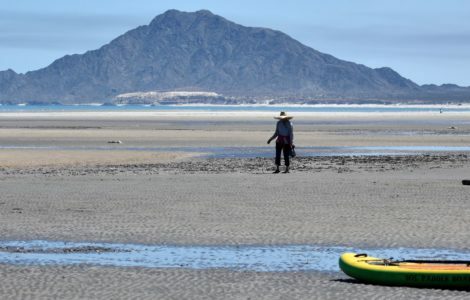 Only about 30 of the critically endangered vaquita remain in Mexico's Sea of Cortez. We must support the efforts to save the species. And we must act now. Our mission is the protection and conservation of all species of porpoise and their natural habitats through research and education. Seen a porpoise? 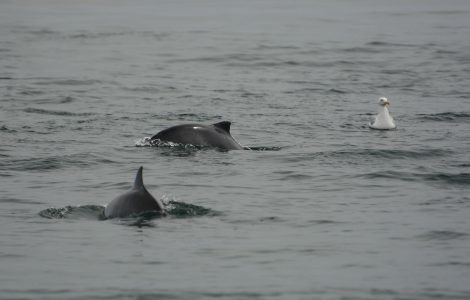 You can support our porpoise research by reporting your sighting. We are a self-supporting non-profit society. Help fund our research and education programs. Help support research and education with the symbolic adoption of a porpoise. Dr. Anna Hall is president of the Porpoise Conservation Society. 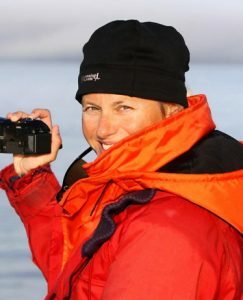 She has spent 20 years researching the harbour porpoise of British Columbia and has worked on seasonal abundance, diet, strandings, habitat use, behaviour and incidental catch. She also took part in the 2008 international expedition to find the critically endangered vaquita. It is with the most sincere pleasure that I welcome you to the Porpoise Conservation Society. This is the world’s first organization dedicated to the research and conservation of the smallest marine mammals – the porpoise. The Porpoise Conservation Society was initiated with the goal of becoming the premier resource for education and conservation of harbour porpoise, Dall’s porpoise, Vaquita, Burmeister’s porpoise, spectacled porpoise and the finless porpoise. These species are found throughout the northern and southern hemispheres, and have been largely overlooked as a result of their small size and the difficulties of finding them in the wild. However, these animals face a myriad of conservation and survival threats, and the Porpoise Conservation Society is dedicated to raising awareness, conducting scientific research and contributing to the long-term survival of all porpoise species through community engagement. The Porpoise Conservation Society is unique in that we are the only organization that specifically focuses on the world’s porpoise species. We aim to become the global platform for discussion, education, scientific research, conservation action and community involvement. We believe that the most effective way to be successful in porpoise conservation is through concerted global efforts. Please join us in our efforts to increase the scientific knowledge, the community awareness and the global conservation actions to protect porpoise and ensure their long-term survival in spite of the increasing pressures being placed on the world’s oceans. The Porpoise Conservation Society invites you to explore our website, engage in our new platform to report porpoise sightings, participate in our local action events as they arise, and join our growing membership. Please feel free to contact us with your porpoise questions or conservation concerns, and thank you for your concern for the world’s smallest cetaceans.